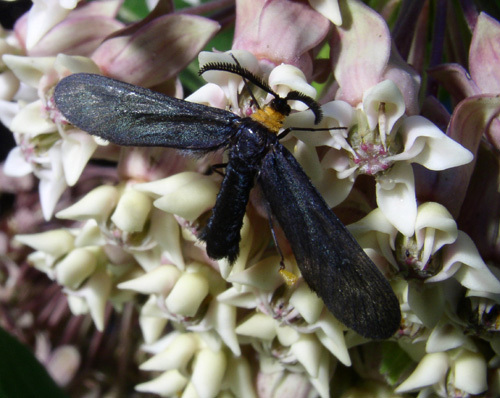 The ailanthus web-worm moth is another day flying moth. 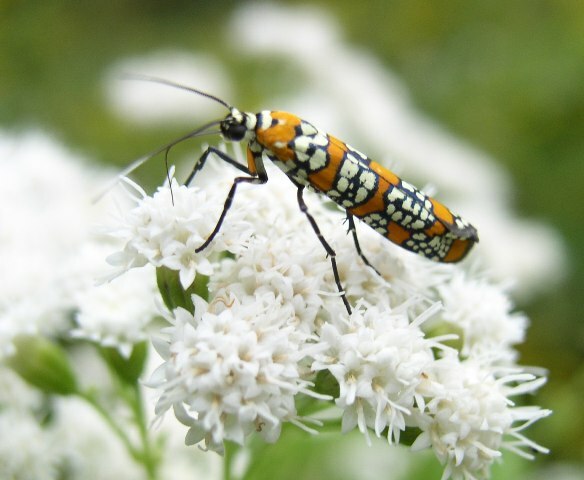 It has a pretty pattern of orange, black and white and keeps the wings folded, so that it looks like a little cigar and may be mistaken by a beetle. It is small, the wing span can range between 1.5/8 and 2.2/8”. It has become more abundant and widespread in recent years because its caterpillar used to feed on a tree common in Florida, the paradise tree. When the tree of heaven or Ailanthus altissima, was introduced from China the caterpillar adapted to this new species. Now it is found in many states where this tree is used as an ornamental. The caterpillars stay in groups and build webbed nests. 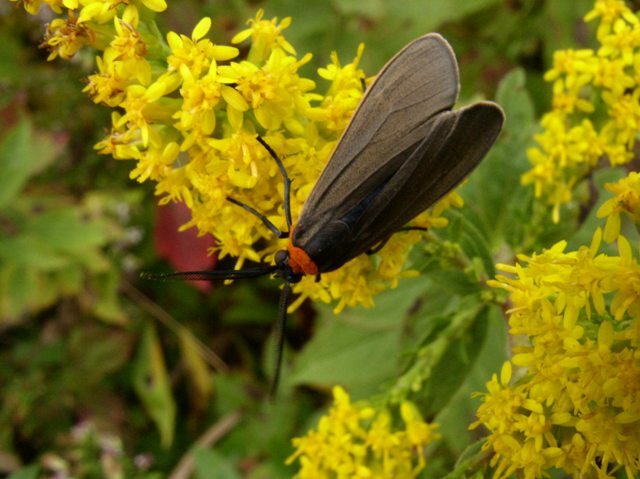 A day-flying moth is the yellow collared scape moth, with a wingspan between 2 and 2 ¼”. Its wings are bluish black or bluish brown. The abdomen is blue with some iridescent shades. 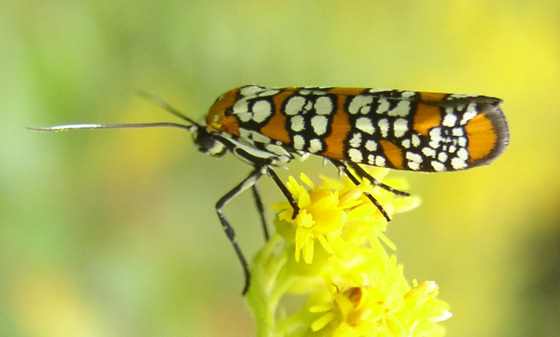 The name refers to the bright yellow or orange collar, very characteristic of this moth; although there are a couple of unrelated moths with a remarkably similar pattern. These are: Virginia ctenucha (left), larger and with an iridescent blue abdomen and the grapeleaf skeletonizer (right), smaller and with a fanned tail. 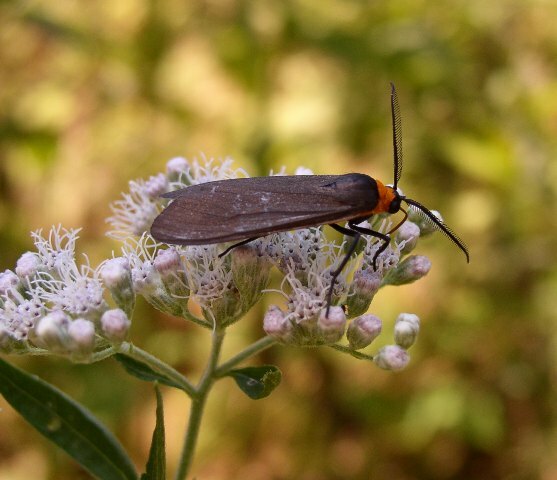 Yellow collared scape moths are frequently found on flowers of Eupatorium. These plants are toxic to most animals. However these moths have developed a tolerance against the toxins. Males feed on these plants and acquire and store the toxins. Later they transfer them to the females as a mating gift. In turn females use the toxins to protect their eggs against predators. Season. 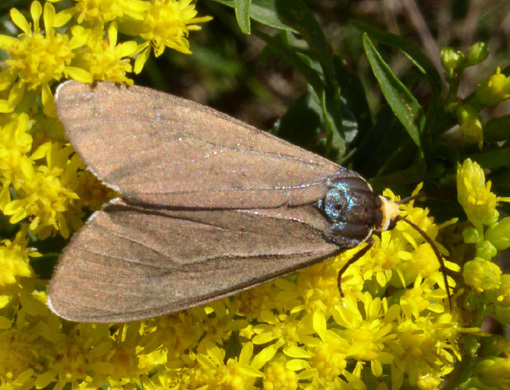 Most common in late summer and fall, from July to October. It can be seen earlier and later, especially in the South. Flowers. goldenrods, many members of the aster family, especially Eupatorium. 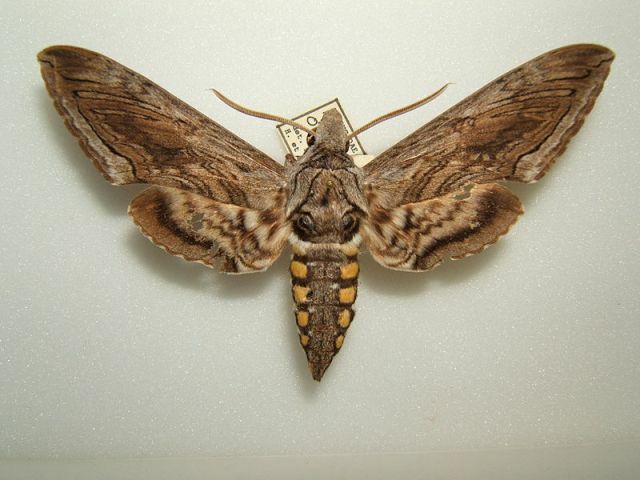 There are a number of hawk moths or sphinx moths that visit flowers, mostly at night. Some of them are truly spectacular and it is a real treat to see them visiting your morning glories or moonflowers, coming back to your garden on subsequent days again and again. The Carolina sphinx can have a wing span as big as 5”. It hides during the day. Its colors blend well with the bark of trees. And it flies at dawn or dusk, visiting flowers which are generally large, white or cream colored, with a trumpet or tubular shape and with a strong scent. It has a very long tongue that can reach the nectar hidden inside this kind of flowers. 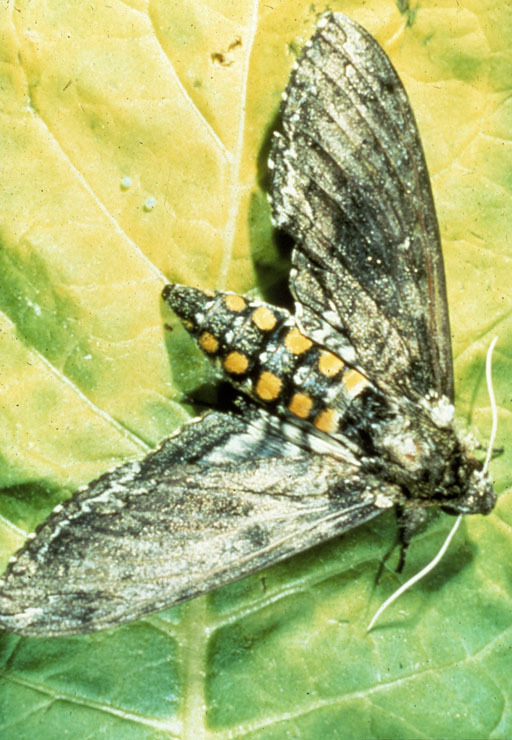 The five spotted sphinx is very similar but it has five golden spots on its abdomen, instead of six. The lines on the wings are not as pronounced and are not separated by white lines as those of the Carolina sphinx. The five spotted is even a little larger, with a wingspan of up to 5 ½”. They both visit the same kinds of flowers and have a similar schedule. Another name for these moths is tobacco and tomato hornworms, referring to the horn at the rear end of the caterpillars and to the fact that they feed on the mentioned plants. They can be as thick and long as your small finger. They are green and hide very well in the foliage. They are hated by gardeners and farmers because they can cause serious damage to the mentioned plants as well as potatoes and other related ones. Habitat. Gardens, dawn or dusk. Most of the United States, but primarily the East. Flowers. Morning glory, moonflower, petunia, Datura, four-o-clock. HUMMINGBIRD MOTHS. Where do they go in winter? Not all moths fly at night; some choose to do it during the day. One of them is the hummingbird moth, so called because it looks and flies and even hums like a diminutive version of a hummingbird when hovering in front of flowers. Just like their feathered namesakes hummingbird moths love long throated flowers, such as bee balm or horse mint. But unlike them, they don’t migrate south when the cold weather arrives. They resort to a different strategy to survive the harsh weather and lack of food. Like all moths and butterflies they have a complex life cycle with dramatic transformations, called metamorphosis. The distinctive stages are called egg, larva or caterpillar, pupa and adult or imago. The one you are most familiar with is the adult, that colorful flying marvel; the other stages are wingless and prefer to remain out of sight and out of danger. The larva’s job is to eat almost non-stop and to grow; the pupa goes through a resting period and later through a tremendous remodeling job where all the parts are transformed to turn into the active, winged creature which we see during the summer. The flying adult’s whole purpose is to find a mate and to start the next generation; for that they need nourishment, nectar, which they find in flowers. It is in the resting state of pupa that they choose to spend the winter. After the caterpillar reaches full size feeding on any of its favorite plants, such as hawthorn, black cherry or wild rose, it drops to the ground. There it spins a loose cocoon that lies partially buried under the leaf litter. Leaf litter is very important to this species; it provides some protection against the winter weather and against predators. When birds or squirrels go through leaf litter, scattering it here and there, they may very well be looking for one of these nutritious morsels. If the pupa survives these attacks, it will complete its metamorphosis and emerge as a winged adult next spring, when nectar-laden flowers are blooming again. You are currently browsing the archives for the moth category.